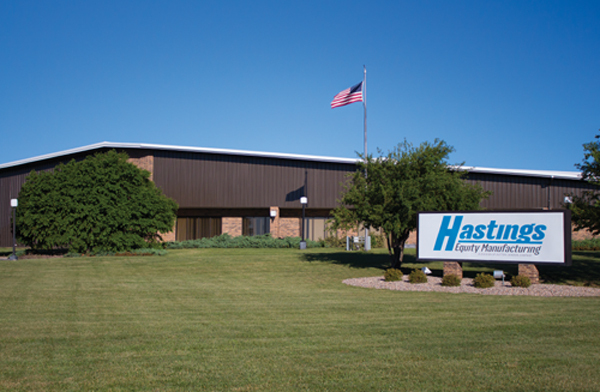 In 1910, Hastings Equity Manufacturing was founded in Hastings, Nebraska with a commitment to quality and service in the sheet metal fabrication industry. As our original name indicated, the first main product category from Hastings Equity was grain bins. Over 100 years later, a lot has changed. Even though we haven't made a grain bin in over 50 years, we still have the same commitment to service and quality that we have had for over 100 years. Hastings Equity Manufacturing now focuses primarily on the manufacturing of steel and polyethylene stock tanks. We also make additional lines of diverse products to service agricultural and industrial needs, and we have extensive custom sheet metal and roto-molding manufacturing capabilities. In 2011, Hastings Equity Manufacturing was bought by the Dutton-Lainson Company, which is also located in Hastings. Dutton-Lainson Company brought more than 125 years of quality, U.S.-based manufacturing experience to the mix, along with extensive resources and support. At the time of the acquisition, Hastings Equity's sister company, Doerr Metal Products of Larned, Kansas, was consolidated with the Hastings operations. We now run multiple production shifts and our own 5-truck fleet out of the 150K square foot facility in Hastings. We work hard every day to meet our customers' needs from our own back yard in Nebraska, to as far from home as Montana, California, and Texas.